France's Alstom has confirmed that one of its subsidiaries is to build the world's biggest passenger ship, the Queen Mary II. The $780m vessel - to be constructed at the Saint Nazaire shipyard of Chantiers d'Atlantique - will be the length of four football pitches and the height of a 23-storey building. It will contain some of the most luxurious accommodation ever fitted in a cruise liner and have features including a ballroom, five swimming pools, a planetarium and a kennels and pets area. "Queen Mary II will be a piece of history and a work of art," said Patrick Boissier, Chantiers d'Atlantique chairman. Larry Pimentel, the president of Cunard Line, which commissioned the ship, said: "She will be heir to all that has gone before and... will carry the grace and elegance of a bygone era into the future." Cunard, whose current flagship vessel is the Queen Elizabeth II, said its new liner would be the "first true ocean liner to be built in a generation" and have "grand staircases, expansive promenades, elegant grand restaurants and gracious public rooms of an imposing scale". Chantiers d'Atlantique won the contract to build the Queen Mary II after beating off competition from the Belfast, Northern Ireland yard of Harland & Wolff, which has since announced hundreds of job losses. The client, Cunard Line, is owned by Carnival Corporation of the US - the world's biggest cruise operator. 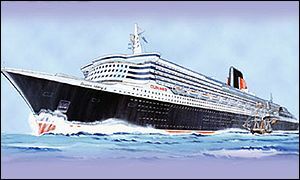 It is due to take delivery of the Queen Mary II in late 2003. The ship will fly the UK's Union Flag and have Southampton as its home port. Chantiers de l'Atlantique's parent company Alstom is 24% owned by British firm Marconi - formerly GEC - and listed on the Paris, London and New York stock exchanges. Its other main individual shareholder is French telecoms equipment supplier Alcatel, which also holds a 24% stake. Analysts said Alstom - due to report first-half results on Tuesday - might slip into the red this year because of troubles at its gas turbines division.